Stop Snitching Shirts – Work! First created as a novelty shirt. 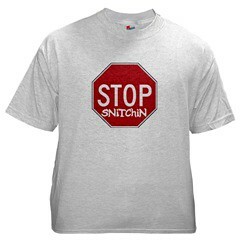 The “Stop Snitchin(g)” shirts gained mass popularity after being featured in rap videos. But the effect of the hip hop culture extends beyond simply wearing these shirts: it’s actually reduced snitching. Talk about being a slave to fashion. Certain courts have even banned wearing the shirts in the courtroom due to their effect on witnesses.